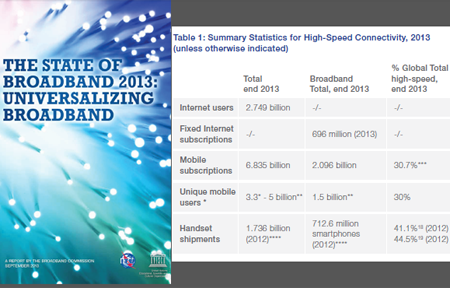 By the end of 2013 there will be more than three times as many mobile broadband connections as there are conventional fixed broadband subscriptions, according to a newly issued report from The Broadband Commission for Digital Development, a joint initiative of the International Telecommunication Union (ITU) and UNESCO. The goal of the report is to provide a global snapshot of broadband network access and affordability, with country-by country data. The Republic of Korea continues to have the world’s highest household broadband penetration at over 97%. Switzerland leads the world in fixed broadband subscriptions per capita, at over 40%. By comparison, the US ranks 24th in terms of household broadband penetration, and 20th in the world for fixed broadband subscriptions per capita, just behind Finland and ahead of Japan. In terms of Internet use, there are now more than 70 countries where over 50% of the population is online. The top ten countries for Internet use are all located in Europe, with the exception of New Zealand (8th) and Qatar (10th). ITU (2013) estimates that some 200 million fewer women are online, compared with men.